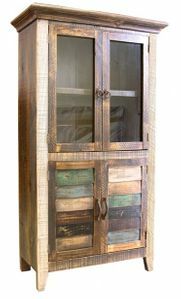 LodgeCraft has been making our own rustic bookcases and furniture since 1988. We also offer bookcases from other select manufacturers. These beautiful useful pieces of furniture have old fashioned world charm. What an attractive way to display your selection of classic novels. With varying shelf depths, you can organize your collections or display your favorite clocks, vases, bookends, and antiques. Choose from a variety of styles, including log bookcases, reclaimed barnwood, rustic, and mountain modern bookcases, as well as a great selection of wood types and finish options. Hickory or Pine Log bookcases, and Rustic Pine or Alder bookcases are available directly from our LodgeCraft workshop in the Flathead Valley.